Whether wrinkles, loss of firmness, uneven skin tone, clogged pores, and red or darkened flaws are your concerns, retinol can make all the difference in the world! Regardless of your age or skin type, retinol is a superstar skin-saver you need to know about. But how does it work? With this easy to understand guide, we'll walk you through everything you need to know before shopping for any retinol product! Retinol is another name for vitamin A. There are many derivatives of vitamin A, but retinol is the name for the pure form. Vitamin A has a fascinating impact on skin’s surface because it can help restore a more youthful look and feel. When skin is affected by environmental assault (and everyone’s skin is) or you have signs of aging, uneven skin tone, enlarged pores, and skin prone to bumps, retinol steps in and seems to intuitively know what your skin needs to minimize those concerns. In short, lots of things about your skin’s appearance can improve when you add a product with stable retinol to your skincare routine. Once retinol has been applied to skin, it goes to work helping skin normalize skin’s look and feel, working in tandem with other ingredients proven to visibly diminish numerous skin concerns. Retinol also helps promote a firmer look, healthier-looking skin, and naturally turns around concerns like dullness and rough texture. With retinol, you’ll see renewed, younger-looking radiance, a remarkably smoother appearance, and a noticeable feeling of firmness. When you start using a product containing an appropriate amount of retinol for your skin type, along with daily use of a broad spectrum sunscreen rated SPF 30 or greater, you will love what starts happening to your skin! Sunscreen is always critical. Even the most effective, research-proven anti-aging ingredients like retinol won’t work as you want them to if you’re not diligent about daily sun protection. It is also important to remember that even though vitamin A is a superstar antiaging ingredient for skin, one special ingredient is NEVER enough to take the best possible care of skin. This fact is why all of our Paula’s Choice formulas contain other vitally important skincare ingredients to help rejuvenate and sustain skin’s smooth appearance such as antioxidants, skin-replenishing ingredients, and skin-restoring ingredients, of which retinol is one. 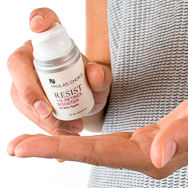 One more comment: When it comes to retinol products, packaging matters! Retinol is a potent yet delicate ingredient, and readily breaks down with routine exposure to light and air. For these reasons, avoid retinol products packaged in jars or clear containers.